Barbara Streisand’s fan base is big, diverse and critical. 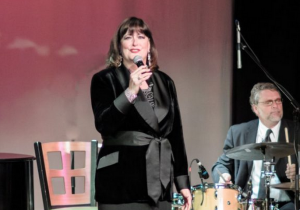 Their collective ear for one of the First Ladies of the American Songbook has been finely tuned over decades of Streisand’s successful and polished music-making. Some of these fans already know that the 145 million album-selling vocalist is the best-selling female artist of all time. There was cause for high expectations. 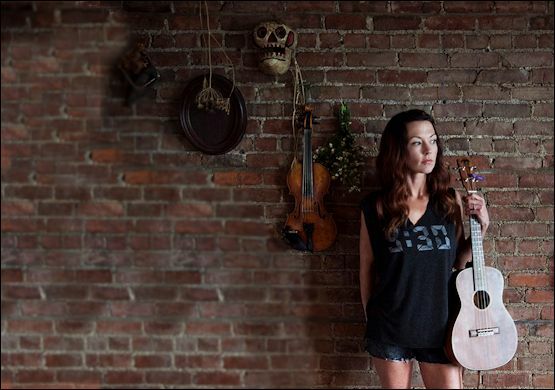 It is a time when some of the brightest female Songbook vocalists have been silenced. Performances by Julie Andrews (“ How Deep is the Ocean”) and Linda Ronstadt (“ Someone to Watch Over Me” with maestro Nelson Riddle) stand as bittersweet reminders of past excellence. 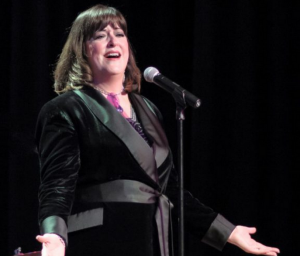 It turns out that in Ann Hampton Callaway’s affection for Streisand, fans have more than met their match. Callaway’s connection to Streisand is enduring, with two Callaway songs recorded by Streisand — one of them at the latter’s wedding ceremony. Not only that, but Callaway has had a hand in two TV specials featuring the American Songbook. In this she was joined by Christine Ebersole, who appeared on the Landmark stage earlier this year. Last Saturday evening, the audience at Landmark on Main Street got their answer. With an effective mix of Streisand classics and supported by an excellent trio of jazz-influenced musicians, the Huntington-raised Callaway succeeded in redirecting admiration toward herself. She achieved this through witty arrangements, warmth and her own heartfelt wonder at Streisand’s accomplishments. First premiered with the Boston Pops, Callaway’s Streisand Songbook has impressed critics with her unique interpretations. In her third appearance at Landmark, she showed how the performance could be effectively scaled from the Pops to a trio. To accomplish this, Callaway brought an able trio consisting of Tim Horner on drums, Martin Wind on standup bass (with Hartke amp) and Great Neck’s Ted Rosenthal on piano. Regardless of whether the arrangements were by Callaway or Rosenthal, they worked well, especially when giving extended solos to bassist Wind. Take the less familiar “ Lazy Afternoon” (1975). The arrangement began with its original relaxed tempo, but moved to an up tempo bossa nova. This gave the song a dramatic arc that improved on the original – at least for a live performance. Callaway’s original bold vocal phrasing and Rosenthal’s ornamental chromaticism were spot-on. The arrangements handled overexposed classics “The Way We Were” and “Evergreen” (the Oscar winner co-written by Streisand and Paul Williams) with delicacy — by giving them spare arrangements with plenty of breathing room, unlike the lushly orchestrated originals that can tax contemporary sensibilities. When the performance arrived inevitably at the immortal “People,” it was paired with Sondheim’s “Being Alive.” When the Sondheim lyric reached the memorable “Make me confused / Mock me with praise / Let me be used / Vary my days,” the Songbook seemed, for the moment, alive and well. Ann and her trio delivered a set that included “A Sleepin’ Bee,” “Down with Love,” “At the Same Time,” “Don’t Rain on my Parade,” an especially buoyant “Lover Come Back to Me” and ended with the signature Streisand song, “On a Clear Day.” The audience sang along with “Happy Days” and left the hall smiling. 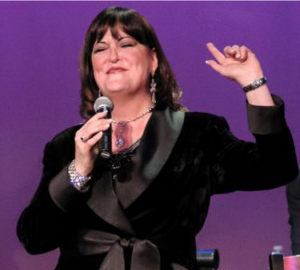 With only a passing reference to the once-weekly airing of her theme song for “The Nanny,” Ann Hampton Callaway remained true to the larger-than-life icon while crafting a captivating story of her own. Aided by said arrangements and unerring intonation, Callaway conquered some of the more challenging Streisand songs, including a note-perfect version of the Yentl closer, “Piece of Sky.” Its final syllable, “Fly!” — still soaring in the confines of a won-over Landmark — beckons for a fourth visit by Callaway and her trio. 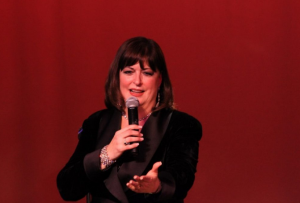 Callaway fans will want to schedule Landmark’s other Main Stage Cabaret shows for the season. They include Andrea Marcovicco, Clint Holmes and Jarrod Spector, who is appearing in “Beauty,” a musical about the life and music of Carole King. Photo Credits: Steve Silberstein, Jeff Dunn & Landmark Staff. Originally posted at Port Washington Patch.